Crony capitalism is on a decline, according to the Economist’s index of crony capitalism created in 2014. The Economist index shows that in 2016, Russia has the highest amount of crony capitalism; crony sector wealth constitutes 18% of Russia’s GDP, out of the ratio of billionaire wealth to GDP of 21.3%. Malaysia comes next; out of the billionaire sector wealth of 13.3% of GDP, crony sector wealth is 13% of GDP. India is 9th in the crony capitalism index; crony sector wealth is 3.4% of GDP, while total billionaire wealth is 11.7% of GDP. Crony billionaire wealth has shrunk worldwide to USD 1.75 trillion, a fall of 16% since 2014. Crony wealth in the developed world has remained steady, at about 1.5% of GDP, while the developing countries have seen a fall in crony wealth from a peak of 7% in 2008 to 4% in 2016. The index uses the data from Forbes’ ranking of billionaires around the world. Then, each billionaire is ranked as a crony or not depending on the industry in which he or she is most active. Next, the Economist compares countries’ total crony wealth to their GDP. The index ranks a selection of countries, the five richest ones, the ten biggest emerging ones, and a few others where crony capitalism is rife and data is available. The crony index is based on the idea that some industries are more prone to ‘rent seeking’ than others. Rent seeking occurs when the owners of an input of production, such as land, labour, machines or capital, are able to earn more profit than they would get in a competitive market. Thus, firms can form cartels or monopolies to extract ‘rents’, or earn ‘rents’ through exemptions or other advantages gained by lobbying the government. Rent seeking can involve the paying of bribes, but is often legal. It can be the result of a lack of competition, poor government regulations, the transfer of public assets to firms at bargain prices and so on. The ‘rent seeking’ industries include industries involving commodities, those in the energy sector, those involving real estate and construction, those operating ports or airports, the banking industry, and the defence industry. Why is Crony Capitalism on a Decline? The past 20 years were a golden era for crony capitalism. Governments in the developing world were actively involved in supporting industries in their countries, where the agenda was to bring fast growth through industrial expansion. As commodity and property prices soared, so did the fortunes of companies that were able to take advantage due to government patronage. One explanation for the decline of crony capitalism is that cronyism was just a phase that the globalizing world economy was going through. Funds were ample during the 2001-2008 phase, with high capital flows from developed to emerging countries, leading to rising property prices that resulted in a boom in commodities. One good example is China Well-connected people gained favourable access to land, cheap loans and telecom spectrum; the spread of wealth through the emerging world provided a growing market for mobile operators. Now, that boom is over. Cronyism has also led to a counter-reaction from the growing middle class, leading to stricter government rules and increasingly competitive markets. However, there is reason for caution. It is difficult for governments to clean up their systems. After all, corporate donations drive political parties. Reform is especially hard in countries with coalition politics. Corruption remains endemic, and the legal system is overburdened and unable to do timely enforcement of the law. Crony capitalism may have moderated, but is impossible to remove completely. The power and scope of Rakesh’s mind and intellect more than qualifies him to lead india and bestow upon it the highest glory of being the most prosperous nation on earth. 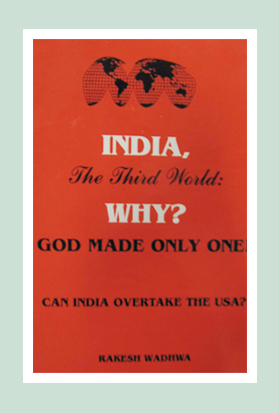 Instead india has rotted for all of the years after independence. I believe Modi and Rakesh would make a great team to free india for good.